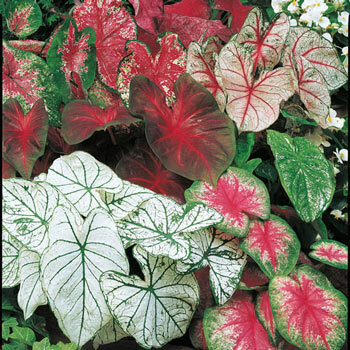 Foliage Type: Large peltate heart-shaped leaves with colorful membranes. 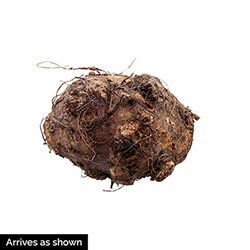 Planting Instructions: Plant 2" deep (bud tips up) and 10" apart. Water well after planting. Place in a warm, filtered light area away from direct sun light which will scorch the leaves. Pruning: No pruning necessary. Remove old leaves when they turn yellow to keep plant tidy. Winter Care: Winter hardy in zones 9-10; lift in all other zones in fall and store in a cool, dry place where they won't freeze. Additional Information: Caladiums are tender and need to be moved indoors for the winter months. Or moved to an unheated garage until spring.